Nocturnal Festival 08 is quickly coming upon us, which means dancing all night under the stars and eating at Denny’s at 4 in the morning. This years line up includes Digitalism, Above and Beyond, Richie Hawtin, Kaskade, and Cosmic Gate and more bands to follow. I definitely have to see Richie Hawtin, aka Plastikman perform. I just hope he plays his classic 20 minute remix of System 7′s Alpha Wave. Above and Beyond is another group that I’m eager to see as well. The song Indonesia off their album Tri-State is a great trance song and a must download. Last year they had Nocturnal in LA and it was really cool. Laser light shows were of course present, but what I really like was when they had images and lasers being projected on the side of the buildings. It really added to the atmosphere. This year however, they’re having it at the Orange Show Fair Grounds which is now called the NOS Events Center. Yes, you read it correctly, The Orange Show Fair Grounds in San Bernardino. Now the last time I went to something like this in San Bernardino county was Organic Festival 95, but that was in the mountains. Hopefully, the event promoters will create something as memorable as last year. Having Richie Hawtin and Above and Beyond does definitely help though. 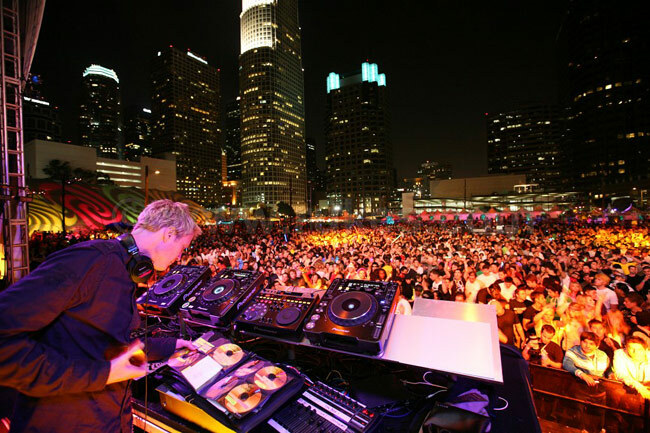 This entry was posted in Concerts, Electronica and tagged Above and Beyond, Alphawave, Digitalism, Nocturnal Festival 08, NOS Events Center, Plastikman, Richie Hawtin, System 7. Bookmark the permalink.